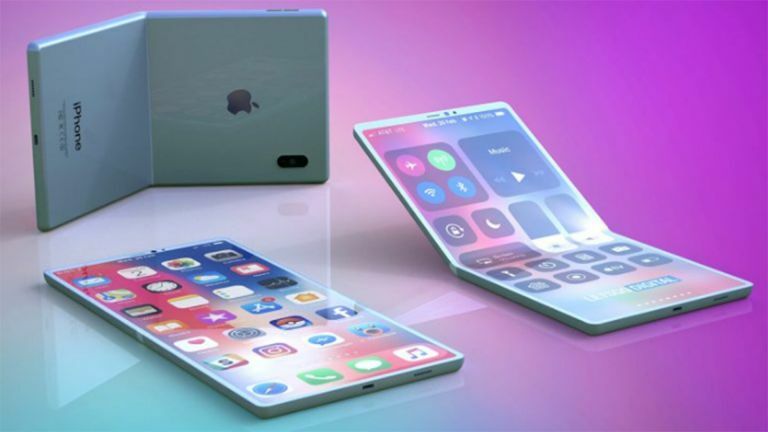 The year of folding phones is here and even Apple is working on a foldable iPhone and these new concept images have us feeling very excited about this potential sibling to the iPhone 11 and definite competitor to the Samsung Galaxy X. While the iPhone 11 is set to arrive in 2019, along with a whole host of foldable Android phones, we may have to wait until next year to see the foldable iPhone. This rumour comes with images, compliments of LetsGoDigital which has unearthed an Apple patent describing the flexile phone. The official Apple patent talks about a clamshell foldable iPhone where the fold sits across the horizontal centre of the display. This is a dual hinge that allows the phone to be folded both inwardly and outwardly also – ideal for folding away to protect the screen, or out to prop it up for hands-free viewing, of half the screen at least. This could be a nice way to screen share with a person sitting opposite. The cameras will sit at the top of the phone, so there's very little change or need to redesign the phone in that instance. Rumours suggest Apple will do away with its current Lightning connector in favour of USB-C for 2020 phones, so expect that to feature on the foldable iPhone also, meaning super fast charging. LetsGoDigital says that Apple could launch this foldable iPhone alongside its iPhone 12 which is expected to arrive at the usual Apple annual release cycle in September 2020 – but do note that that is speculation and the design could never actually make it from sketch to reality.